The Huntington Lighthouse Preservation Society will present the 8th Annual Lighthouse Music Festival in Huntington Bay, NY on Saturday, August 30, 2014. 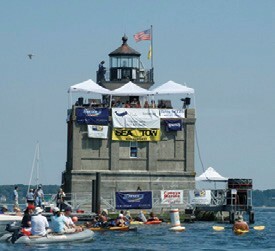 Started in 2007 to increase awareness of the Huntington Lighthouse plight and bring a unique fundraising event to the Long Island boating community, this is the only music festival in the world held on top of a working lighthouse in the middle of the water! The festival is held annually on Labor Day weekend and attendance has grown to over 1,000 boats with more than 10,000 attendees from New York, Connecticut, Rhode Island and New Jersey arriving in watercraft of all kinds. Bands will perform on the roof of the historic lighthouse from 11 am until dusk. The Lighthouse Teens on the Water program encourages local teens to volunteer for community service credits as a fun learning experience. Dressed as pirates, they visit each boat to hand out souvenir bags, sell t-shirts, and “loot” vessels for “bounty.” Last year, $25,000 was raised through their efforts alone. Concerned citizens founded the Huntington Lighthouse Preservation Society in 1985 to prevent the demolition of the Lloyd Harbor Light Station, which would have been replaced by an automated steel tower. The organization is dedicated to the ongoing preservation of the lighthouse’s interior and exterior, its preservation for public use as an educational and historic resource, and its maintenance as an active aid to navigation. Today, Huntington Harbor Lighthouse is severely threatened by acute erosion from its marine environment and the effects of severe storm damage, including interior flood damage and dock damage from Hurricane Sandy. Structural failure of the foundation is evident in six crucial locations, much of this caused by increased wave action from marine traffic. Furthermore, the cast iron cupola, windows, doors and casings are all severely deteriorated, allowing water penetration into the lighthouse’s interior. The Huntington Lighthouse Preservation Society has embarked on a $1,500,000 capital campaign to fund projects that include restoring the foundation, adding riprap around the foundation, repairing the roof and docks, replacing or repairing windows, creating educational aids for visitors, and more. For more information including a list of bands, visit lighthousemusicfest.com.